Sensitive skin as a condition comes with its own set of challenges. If you have sensitive skin, you know special and gentle care is crucial, which means products that treat dark marks and uneven skin tone would usually be considered a no-go, as they could trigger a skin reaction or result in blemishes. NIVEA consumer research shows that many South African women are concerned about even tone products causing skin irritation. The breakthrough care reduces the appearance of dark marks, for radiant and even toned skin. This face care range has been specially developed for sensitive skin to treat a myriad of challenges for this particular condition in a holistic way. The main reason behind uneven skin tone is melanin, the natural pigment in the skin. Sometimes the skin can overreact and produce too much melanin, which is then not evenly distributed through the skin. What causes this? Sun exposure is the main trigger, as well as hormone fluctuations, inflammation from plucking and breakouts or skin irritations from products that don’t agree with the skin. With age, the skin becomes less capable of regulating melanin production and ensuring it is evenly distributed through the skin. Skin becomes dull, drier, ashen and less radiant than before. Sensitive skin needs intensive moisture and support for skin’s natural resilience against irritations and breakouts. 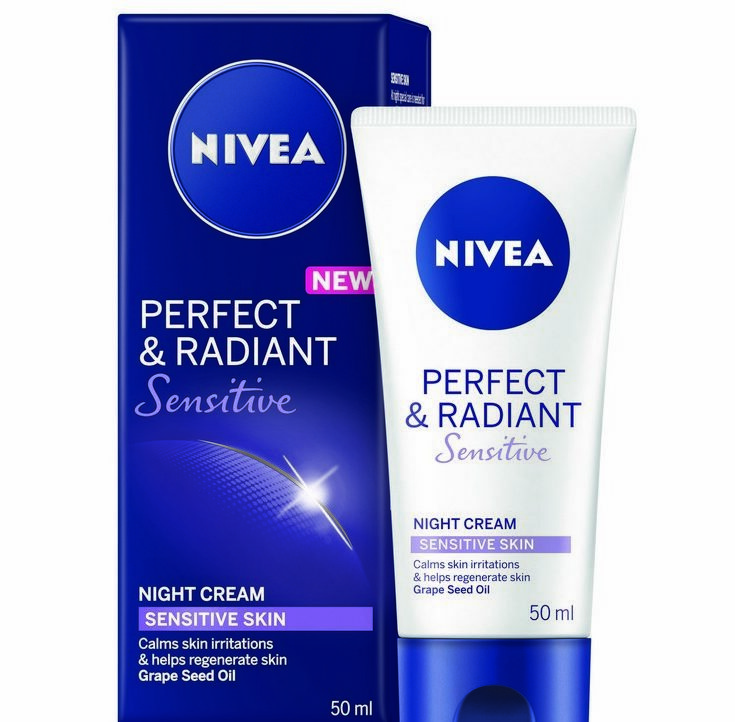 The non-irritating formula of NIVEA’s Perfect & Radiant Sensitive range combines two natural ingredients, and of course, the products are free of colourants and fragrance. UV protective and anti-inflammatory, the antioxidant Liquorice Extract is a well-known botanical helper in evening-out skin tone. Liquiritin (an active compound in Liquorice Extract) assists with breaking up melanin and is also super-soothing too. Grape Seed Oil does wonders for sensitive skins, because it’s a powerhouse dose of antioxidants and anti-inflammatory care. A super blend of phenolic compounds, free fatty acids and vitamins means extra protection for this particular skin condition. This light and fast absorbing day cream works in unison with the skin to gently reduce the appearance of dark marks and restore skin radiance. Added to these benefits, this day cream helps to reduce skin irritations too. An SPF of 15 has been included in the formulation to protect your skin as you wear it, meaning guarding against further formation of dark marks, and even premature ageing. At night, special care is needed for sensitive skin to help support its regeneration and strengthen its barrier to protect it from further irritation. This soothing and nourishing night cream helps support your skin’s regeneration process at night, working while you sleep and providing a soothed skin-feel come morning. It also gives your complexion a boost of deep moisture as well as caring and supporting your skin’s own anti-sensitivity defence mechanisms. So, if you really want to make sure that the products you use are intended for your skin, make sure that all the ingredients in your products are suited to the specific needs of your skin.